And it stayed that way. I thought about work late last night & decided that hey, I’m capable of getting heaps done today, so why break into family time when I really don’t need to? So we snuggled down (as much as one can with a sulky teen) & relaxed. I’m so relaxed right now that I have “losted” my work key and sat in my car until (work) Z appeared this morning! It worked out well as I remembered my alarm code & he couldn’t remember his. Saturday started with boot camp, like it has for the last few weeks. I am enjoying this start to my weekend. We did the other steps at Trusts this weekend for a change; terraces to bear climb (or reverse bear) or run down, steps to run up, ab work on the dock in the sun, listening to the water rush by. I still don’t like being in photos but there is a huge difference between 8 weeks ago and now. I have cheekbones! That’s Loren, Si & myself, with #masetheace above us. Si keeps telling himself (and us!) that he was the rose. Huh. In the afternoon I surprised the kids with the Lego exhibit that was on at Trusts. I won over cynic Teen 1 AND 2, not bad for seven bucks a head! We probably spent a couple of hours there; didn’t buy anything but I am lusting after both the Disney castle and Hogwarts – I have earmarked part of my bonus on a family holiday, part towards a canopy for the new ute and now part for a Lego castle. I am earning it, I may as well be frivolous with part of it! Mase dug into his pile of Lego on Monday and created a robot – he asks that you note the “glasses” it is holding. We also went to Waiwera to soak out the stresses. Biebs stayed home so Lou came; Mase and (regular) Z went down the lazy river, had cannon fights and so on; I got very annoyed at a bunch of 15yo boys who had a go-pro, took over the relax pool and talked (loudly) about boners, shaming fat girls & so on. If any one of them had a gf I’d be very surprised – what little sh*ts. Grateful I don’t see my teens in this mode (altho I am very sure they have a sh*t mode too). Sunday was devoted to Grandma’s house. Two sets of steps are replaced; the gardens are pruned/chopped/weeded, lawns sorted. Hard to believe these were puny $2 buxus that I put in 12-13 years ago. That hedge is as high as my waist now. Monday started at Bethells dunes with Chris & Loren (Paige & her fam were late). For all the time I’ve spend at the beach, I’d never gone into the dune side. Chris had planned a three-step exercise for us and OUCH my calves were cramping very quickly! However apart from the reverse bear crawls up the slope (no-one managed that) & the two-feet-together-jump-up (only Si managed that) & the body drops (I struggle with those as my wrist goes too far, so I sub out) – I managed to complete a set. Si, Loren & Bran were well into their second set at the end of 20. Then we did a final set as nine – Paige had appeared by then – & I think the kids beat us adults hands down. Next time I’ll bring the board to go down the dunes! The rest of the day was devoted to relaxing (we watched Peter Kay’s Tour that wasn’t a Tour vid, totally recommend & I was in stitches for good portions of it and its fairly clean), getting ready for the week ahead (I prep Si’s & my breakfast cereals, snacks & so on for the whole week on Sundays now as a kick-start & did a lot for the kids also), and speaking of stitches, I got in some time on Andie’s round robin. It was a bit awkward as her stitching is the opposite to mine (/// then \\\) and had forgotten that I could turn it 90 degrees to get the same result and use my method. You can tell I clicked yesterday as the progress was so much more! Doh. Ohh, look at me, posting stitchy stuff almost on time! 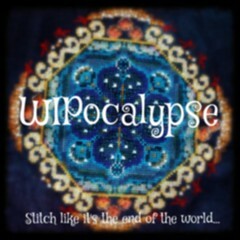 WIPocalypse is hosted by Mel over at Measi’s Musings, & is a monthly round-up of all things stitchy. For October, I’ve been really productive. 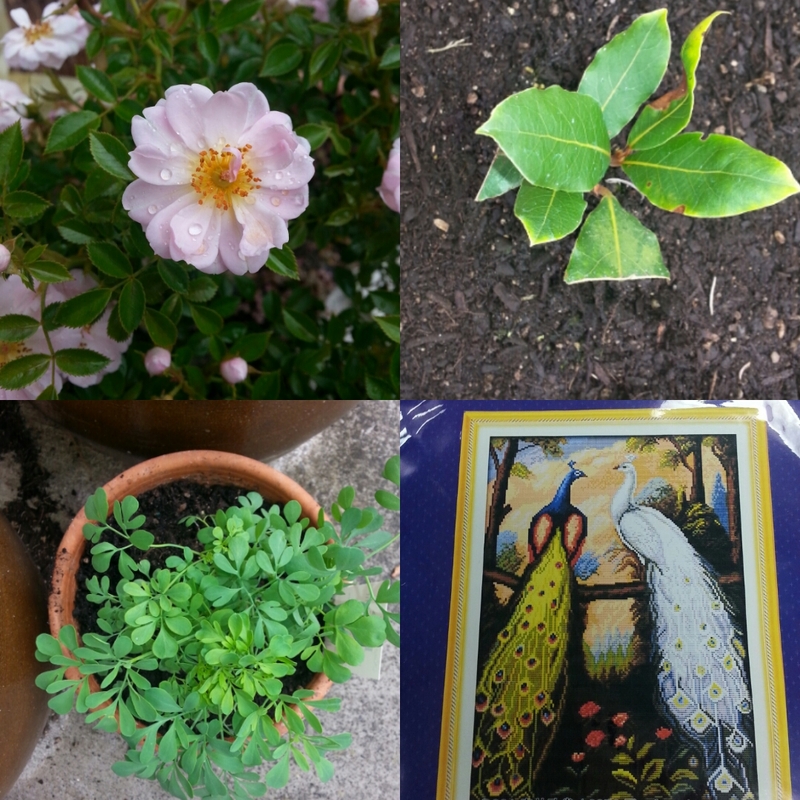 In my garden, all the summer seeds are sown (including a set of herbs for a girlfriend who’s been the main instigator and supporter of my get healthy kick), the apple tree is now espalier’d along the fence, the citrus are fed, all but one bed is weeded – all this despite being sick for a full week. Stitching wise, I’ve finished my initial Round Robin piece. This is going out in the post today (payday!) to Melinda in Akron. I’m excitedly waiting to receive Andie’s piece (I’d say go check out her blog but she’s as bad as I am recently!). I’ve FFO’d 8 Mill Hill pieces, 3 of which I actually started and completed this month. That makes 6 ornaments for the Christmas gifts, and 2 Santa’s. I’m supposed to be swapping a Santa chart & as I sent mine in August, and haven’t got one back, I kind-of doubt that will happen. 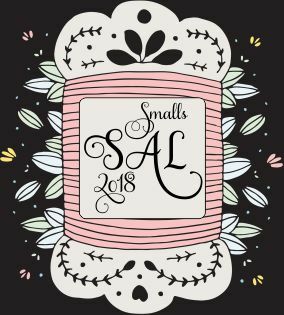 What online stitching communities do you enjoy? Well, I do enjoy watching Flosstube – so much so that I now participate. If you skip back a blog post, you’ll get #5, which has some #passthestash included – but you MUST comment on the video to enter! Entry is worldwide, you must be over 18, blah blah. I’m back on Facebook, primarily for the Round Robin, Stitch from Stash and Butterbean Motivation groups. I cut back a lot of “friends” and its much more peaceful. I’m also on Instagram as @sewscrapmuse. Feel free to request there; if you’ve got stitchy posts I will automatically add you. I got audited for the second part of my job today. Given that I practically invented the process, with minimal input, and I’m getting the outcome my boss wanted, I think I’m sound okay. But it was odd to explain my reasoning and go over scenarios with someone who is removed from the process. In a way I hope he comes up with some suggestions as I am not sure that I can’t refine the process somewhat. Sarah was feeling as “done like a dinner” add I was so we went walking to Kings on the other side of Fowlds Park. She got advice about her magnolia and I brought herbs. I need more potting mix but the Bay & the Rue are in new pots where hopefully they can stay for a while. I also noticed my Little Bo Peep rose is covered in flowers. My Twitter secret santa arrived! Jinny must have paid attention. 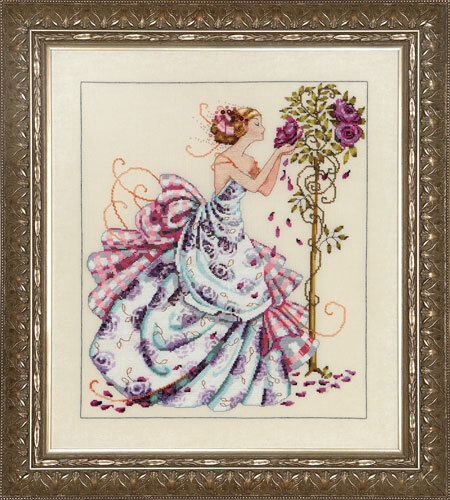 I have plans for the white one in particular; white kreinik and beads to make it shine. I’m waiting to see if Jen got hers (stalking TBH). 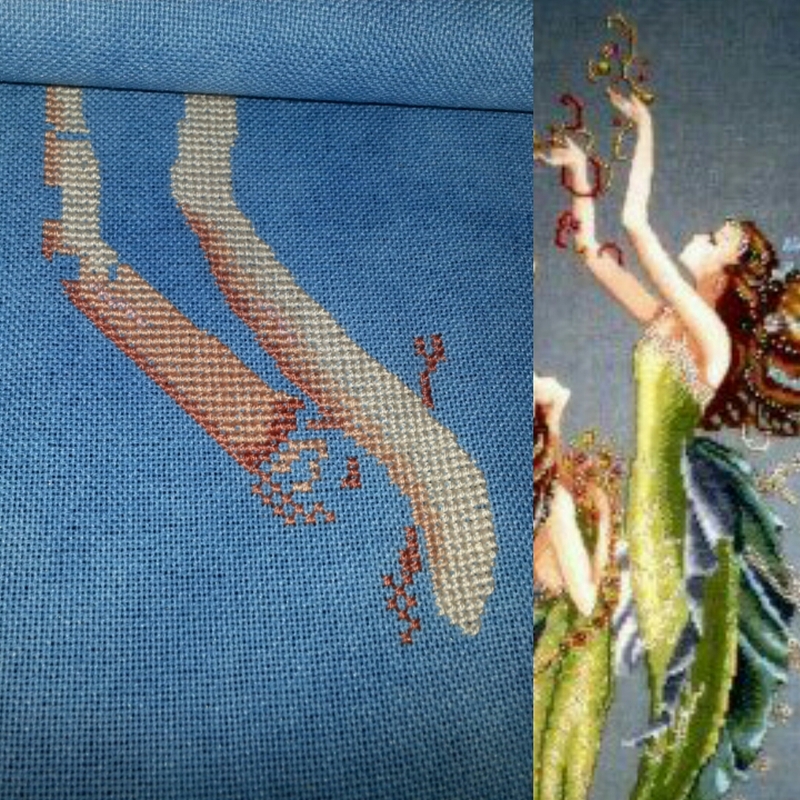 And on the stitching front, as you can see from the IG feed, I’ve got started on Mermaids of the Deep Blue. I did re-chart her hand as it looked odd. I think I’ll be onto her face just as soon as I finish with the skin on her chest. YCQM is a semi – regular post based on my One Little Word for 2015, Serenity. 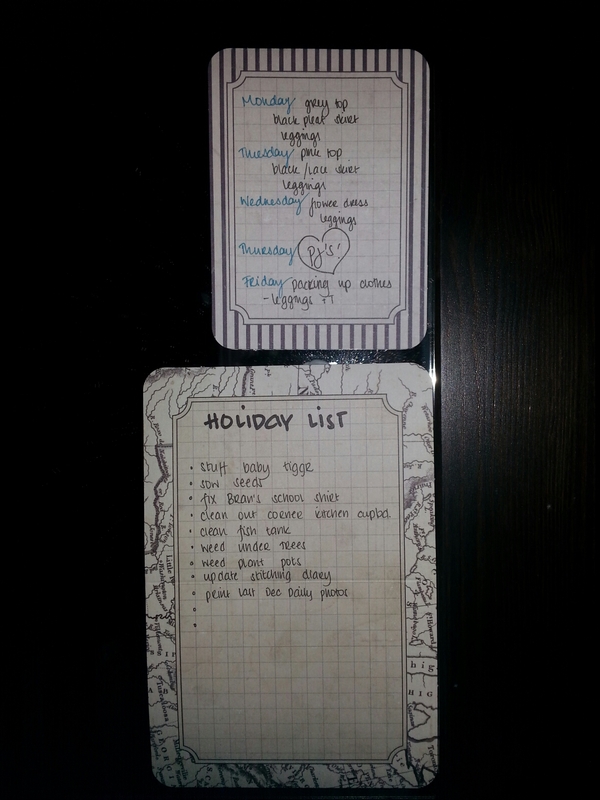 It’s school holidays (yay, said no working parent ever). I’ve taken some time off this week and next (Thursday’s wardrobe choice is your first clue) and there are a number of things I want to achieve. So, list. I love checking things off. And most of these will take 30 min or less. That’s a lot of achievement buzz and I’ll still have a lot of playtime. Also achieved: merit team manager. Hoping this opens more doors in 2016.